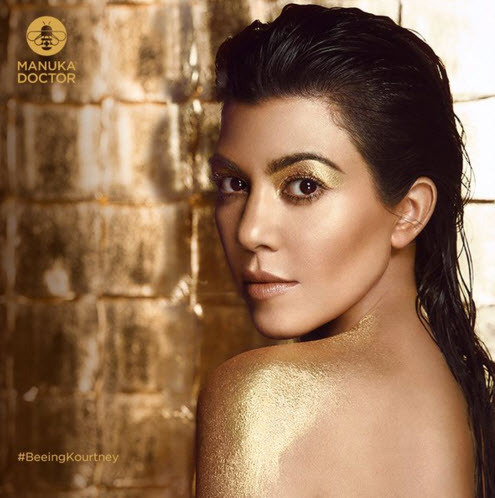 Kourtney Kardashian has been named global brand ambassador for Manuka Doctor. Manuka manufactures a skincare line using Manuka honey and Purified Bee Venom. Kourtney was fan of the products before being invited to become an ambassador. The two-year partnership began this month. Kourtney used the hashtags #BeeingKourtney and #SkincareFromTheHive when she tweeted the news. She has 19 million Twitter followers and over 37 million Instagram followers. Kourtney says in the announcement, "I have been using the Manuka Doctor honey line for many years so when the brand asked me to be their global skincare ambassador. I couldn't have wished for a better partnership. As fans of my show have seen, I am an advocate of products that use natural ingredients. I am incredibly excited to have this opportunity to work with a brand I believe in and introduce it to people around the world." Claire Perry from Manuka Doctor says in the announcement, "When we heard that Kourtney was a fan of our products and a believer in our brand philosophy and approach, we knew that she was the ideal choice for our global ambassador. Her track record of believing in natural products that are backed by science, along with her position as a pop culture icon and committed mom, makes her incredibly relatable to our consumers worldwide."